For the first time, the April meeting of the Institute of International Affairs will move from Masterton to the Carterton Courthouse. 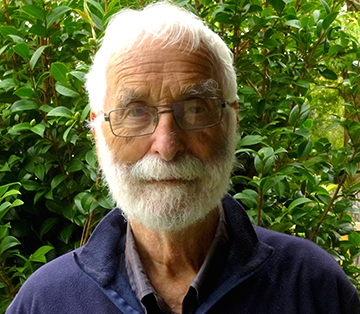 April’s talk, ‘The Case for No Military Defence Force’, will be given by Dr John Gleisner, and will look at several countries without armed forces and ask whether this model would suit New Zealand today. Our grandmother lived in a town close to Rotterdam. We often went to see her, cycling there through lovely countryside. When action had quietened down after the sudden bombing of the city, we went to visit her again. She took us sightseeing through black, ruined Rotterdam. Everywhere dark, black windows stared us in the face, the streets were covered in rubble and glass crackled under our feet. I stared at this scene in horror and yet was fascinated. The picture has never left me. Meanwhile a whole army invaded our village. Germans with horses and carts and field kitchens. They took possession of the empty houses in the village. We children were excited about these Germans and hung around them. They were very friendly towards us and dished out lollies. We still had fun, in Winter we tobogganed on the snow-covered sand hills and skated on the canals. Those wartime Winters seemed to have been very cold, I remember plenty of ice and snow. Why have the Martinborough Fair? April 10, 2018 April 2018 Comments Off on Why have the Martinborough Fair? The idea of a country fair came from Bill Fetch, who became a Rotarian in 1972. Bill had travelled to Germany and was impressed with the village markets there. He felt the Martinborough town square, with its open space and lovely shade trees would make an ideal venue for a similar fair. He believed Rotarians could provide the organisational framework to allow craftspeople to sell their wares. Bill wanted any profits made to be given to local South Wairarapa charities – especially those connected with youth. Give Craftspeople a chance to display and sell their wares. Give local charities a chance to raise funds from a wider range of customers than is usually available. Provide the Rotary Club with funds to give to charities, especially those in South Wairarapa. In accordance with Bill Fetch’ s wishes, special funds have always been set aside for young people. Martinborough shops and other Wairarapa retailers all benefit from the fairs. Lotto does well in Pain & Kershaw, Greytown orchardists report increased turnover and Featherston Gas station puts on extra staff. Hotels, motels, and camping grounds are mostly full, and many private homes overﬂow with out-of-town visitors. 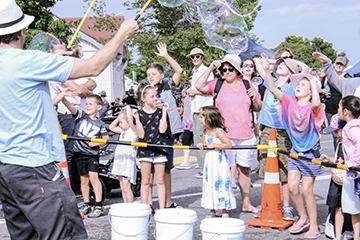 Thanks to the hard work of Rotarians, and especially the conveners and their committees, the South Wairarapa Rotary Martinborough Country Fair is now well established as the premier weekend attraction in Wairarapa’s annual calendar of events. The first fair ran at a loss with 35 stalls, but this time, 41 years on, proceeds from almost 500 stalls enabled South Wairarapa Rotary Club to distribute over $100,000 in Fair support services, grants, bursaries, and project support throughout the South Wairarapa and internationally. Fell through the parlour floor today. The termite found her casket too. Your Auntie Mae weighed half a ton). He also liked the taste of bone. An ant can’t leave an aunt alone.